euphoRHEA: Choriz Upma for President! I love choriz. The Goan variety - full of spices and flavour and nuggets of fat. Among porky ingredients it's my favourite and I fool around with it a lot, adding it to this and that seeing if the combination works. This Choriz Upma is one my great successes. I often eat meals on my own and it goes without saying that I tend to make simple one-pot dishes whenever I can. 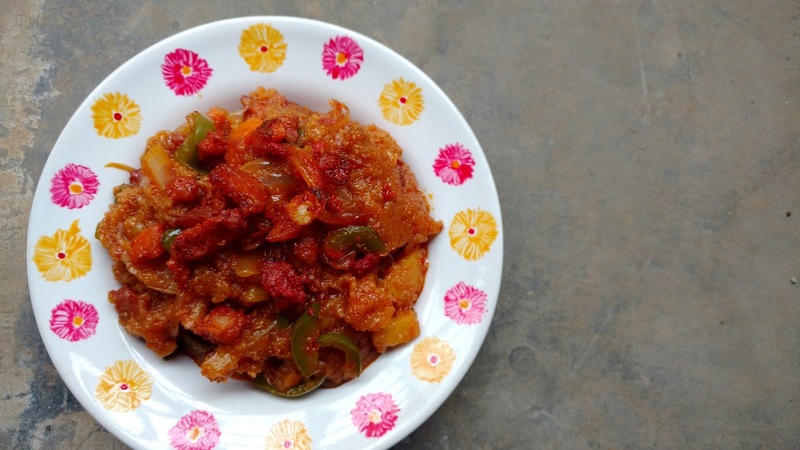 Nonta Suji as we Bengalis call our version of upma, is loaded with vegetables and has a mild tempering of nigella seeds. I used to cook this very often for mom in the later stages of her illness as she found the soft texture of the dish easy to eat. Nonta Suju features on my meals on my own quite often and in pursuit of a variation I decided to try it with a good handful of choriz thrown in. It was one of my best ideas, even if I say so myself! In your wok or kadhai heat a little oil and fry the choriz till it breaks down and has rendered off all the fat. Remove the choriz leaving behind as much of the oil/fat as you can. Discard some of this oil/fat if there's too much and then fry the potatoes and carrots along with the green chilli in the remaining oil/fat in your kadhai. Keep the heat low and cover the veggies while they cook. When the potatoes are half cooked add the sliced onion and stir. Cook till the onions become translucent. Add the julienned capsicum and the green peas and cook for another couple of minutes. If you're using fresh peas boil them before adding them in. Add salt and chilli powder and stir to mix. Then add the roasted semolina and stir over a low flame. Roast the semolina with the veggie mix for a couple of minutes without scorching or burning the semolina. Put the fried choriz back into the kadhai. Reserve a little to sprinkle on top of the finished dish if you like. Add enough water to just cover and the tomato puree/ketchup and give it all a good stir. The semolina will start absorbing the water so keep stirring. Once the upma has reached the consistency you like switch off the heat and serve it hot.